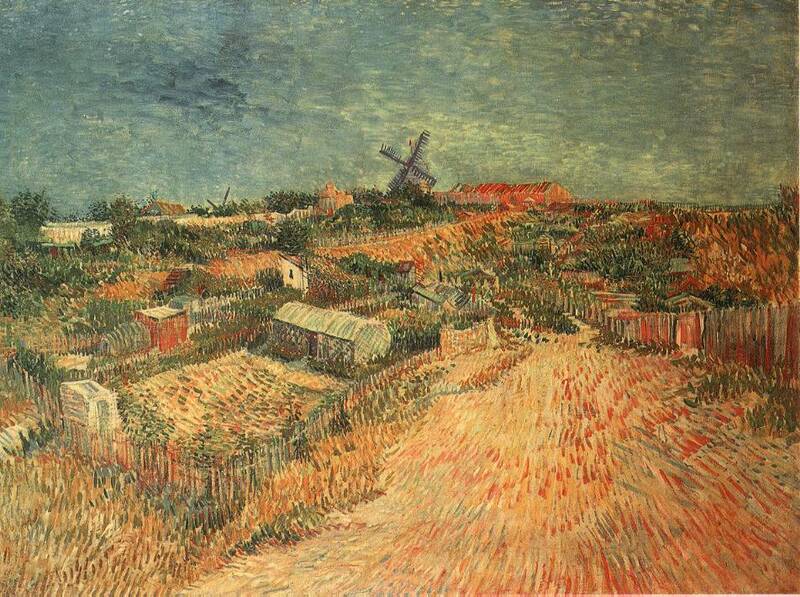 Gogh, Vincent (Willem) van (b. March 30, 1853, Zundert, Neth.--d. July 29, 1890, Auvers-sur-Oise, near Paris), generally considered the greatest Dutch painter and draughtsman after Rembrandt. With Cézanne and Gauguin the greatest of Post-Impressionist artists. 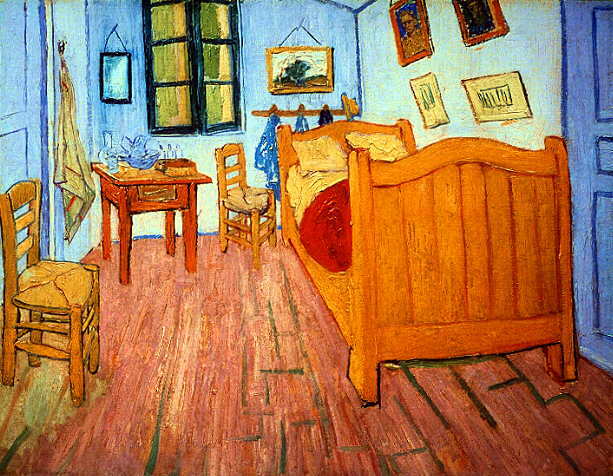 He powerfully influenced the current of Expressionism in modern art. His work, all of it produced during a period of only 10 years, hauntingly conveys through its striking colour, coarse brushwork, and contoured forms the anguish of a mental illness that eventually resulted in suicide. 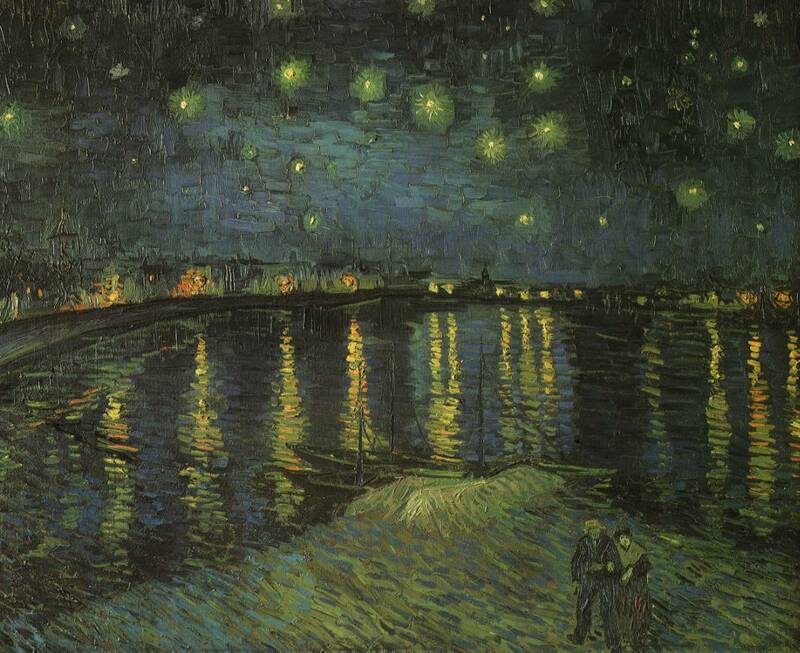 Among his masterpieces are numerous self-portraits and the well-known The Starry Night (1889). 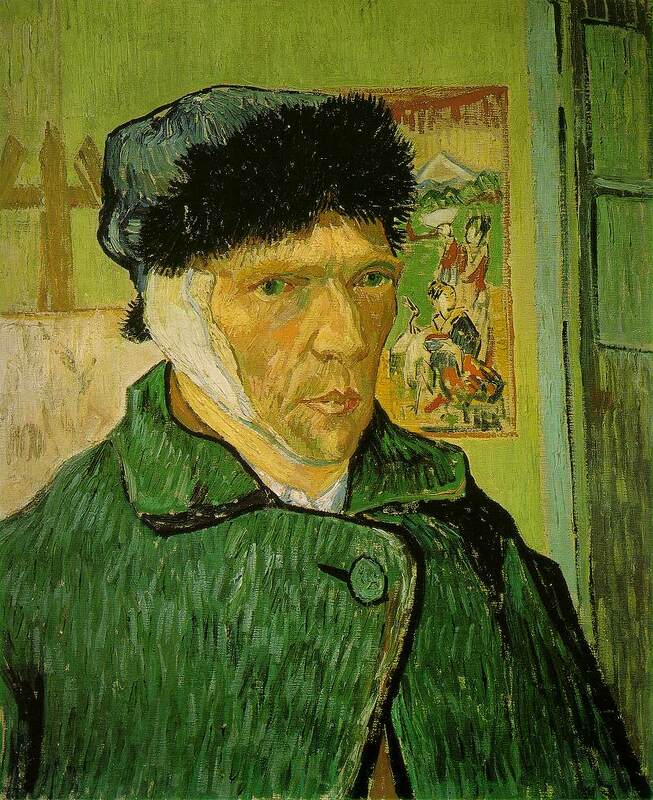 His uncle was a partner in the international firm of picture dealers Goupil and Co. and in 1869 van Gogh went to work in the branch at The Hague. In 1873 he was sent to the London branch and fell unsuccessfully in love with the daughter of the landlady. This was the first of several disastrous attempts to find happiness with a woman, and his unrequited passion affected him so badly that he was dismissed from his job. He returned to England in 1876 as an unpaid assistant at a school, and his experience of urban squalor awakened a religious zeal and a longing to serve his fellow men. 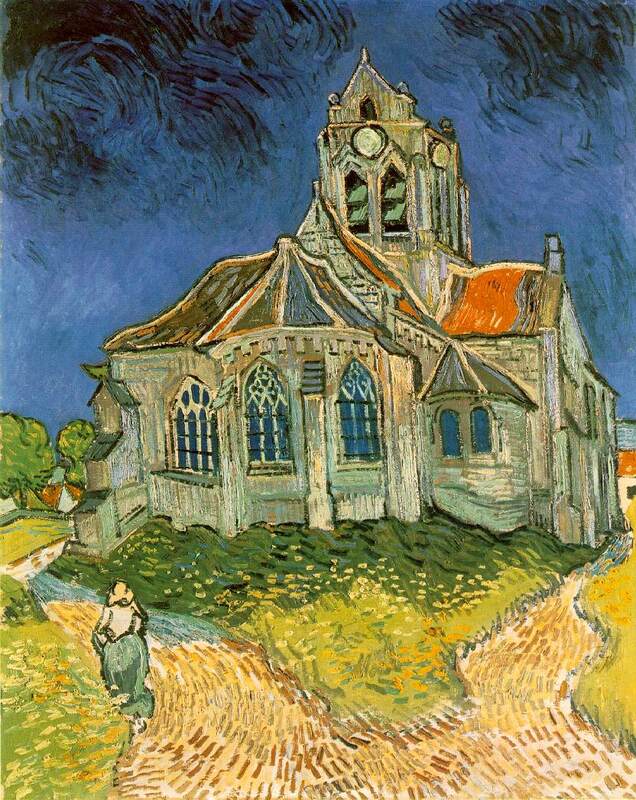 His father was a Protestant pastor, and van Gogh first trained for the ministry, but he abandoned his studies in 1878 and went to work as a lay preacher among the impoverished miners of the grim Borinage district in Belgium. In his zeal he gave away his own worldly goods to the poor and was dismissed for his literal interpretation of Christ's teaching. 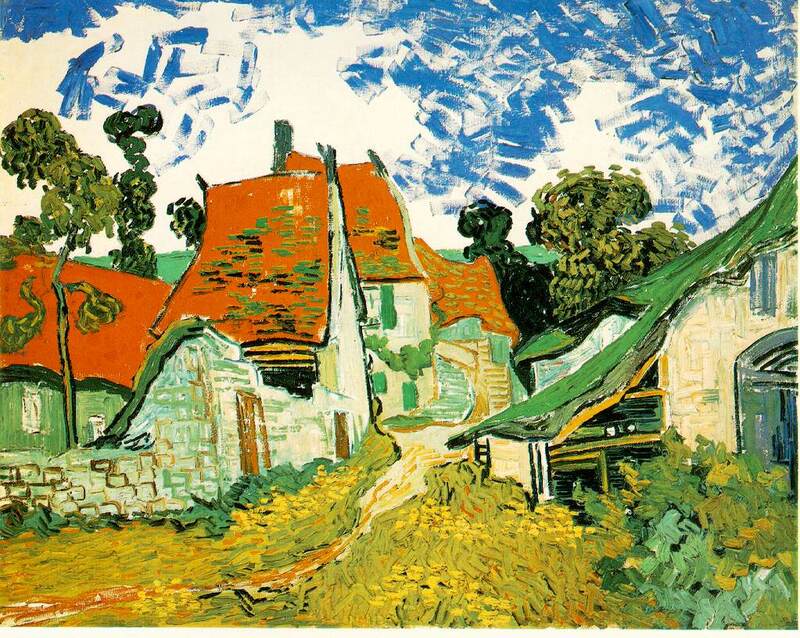 He remained in the Borinage, suffering acute poverty and a spiritual crisis, until 1880, when he found that art was his vocation and the means by which he could bring consolation to humanity. 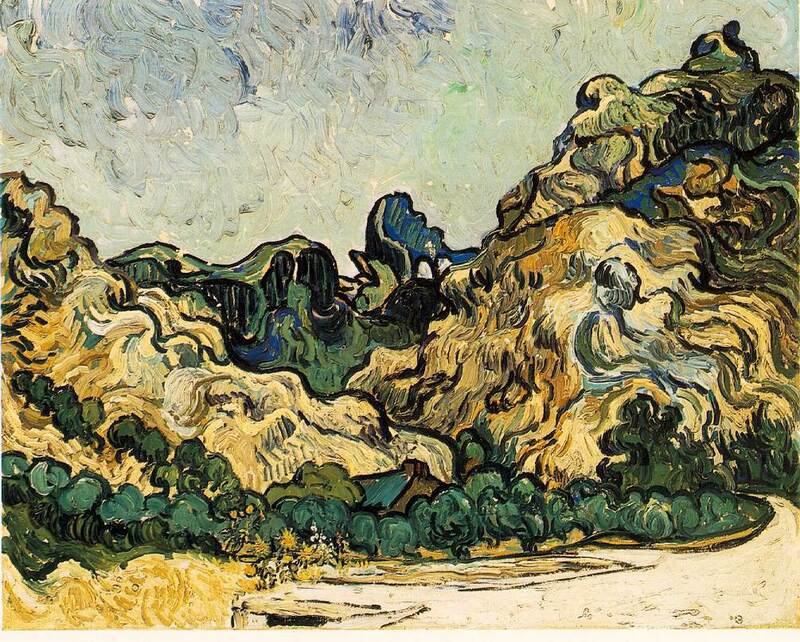 From this time he worked at his new `mission' with single-minded frenzy, and although he often suffered from extreme poverty and undernourishment, his output in the ten remaining years of his life was prodigious: about 800 paintings and a similar number of drawings. 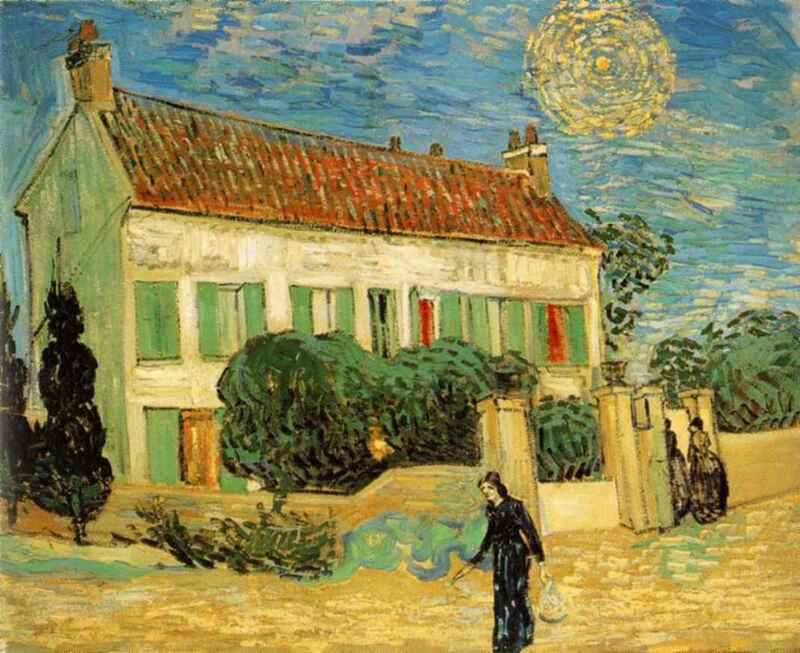 From 1881 to 1885 van Gogh lived in the Netherlands, sometimes in lodgings, supported by his devoted brother Theo, who regularly sent him money from his own small salary. 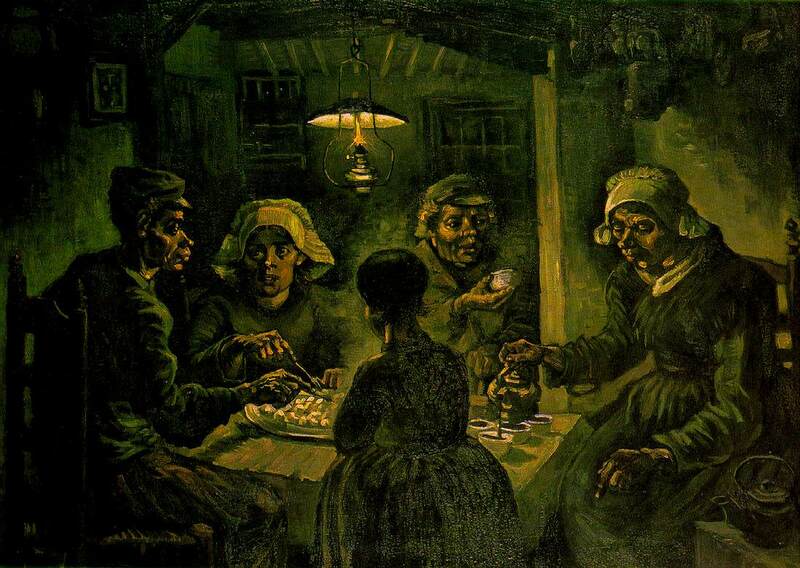 In keeping with his humanitarian outlook he painted peasants and workers, the most famous picture from this period being The Potato Eaters (Van Gogh Museum, Amsterdam; 1885). Of this he wrote to Theo: `I have tried to emphasize that those people, eating their potatoes in the lamp-light have dug the earth with those very hands they put in the dish, and so it speaks of manual labour, and how they have honestly earned their food'. In 1885 van Gogh moved to Antwerp on the advice of Antoine Mauve (a cousin by marriage), and studied for some months at the Academy there. 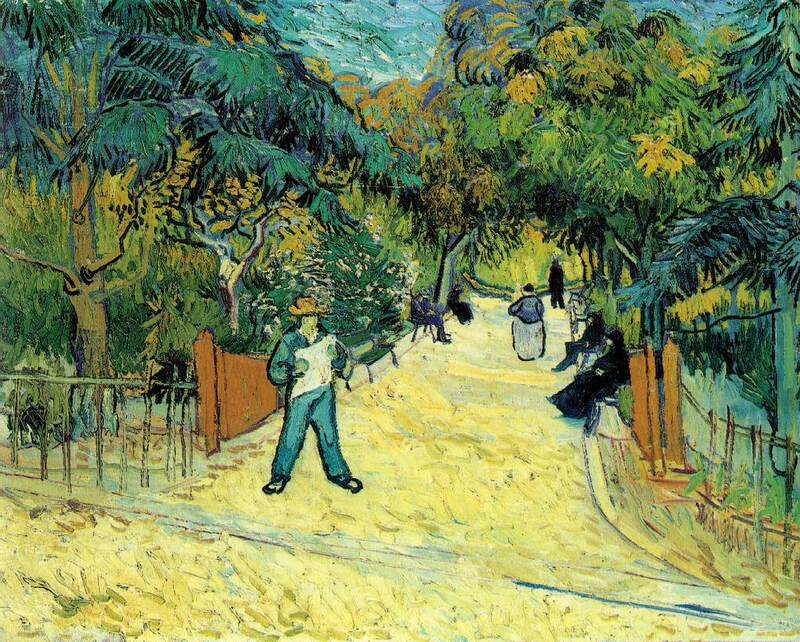 Academic instruction had little to offer such an individualist, however, and in February 1886 he moved to Paris, where he met Pissarro, Degas, Gauguin, Seurat, and Toulouse-Lautrec. At this time his painting underwent a violent metamorphosis under the combined influence of Impressionism and Japanese woodcuts, losing its moralistic flavour of social realism. 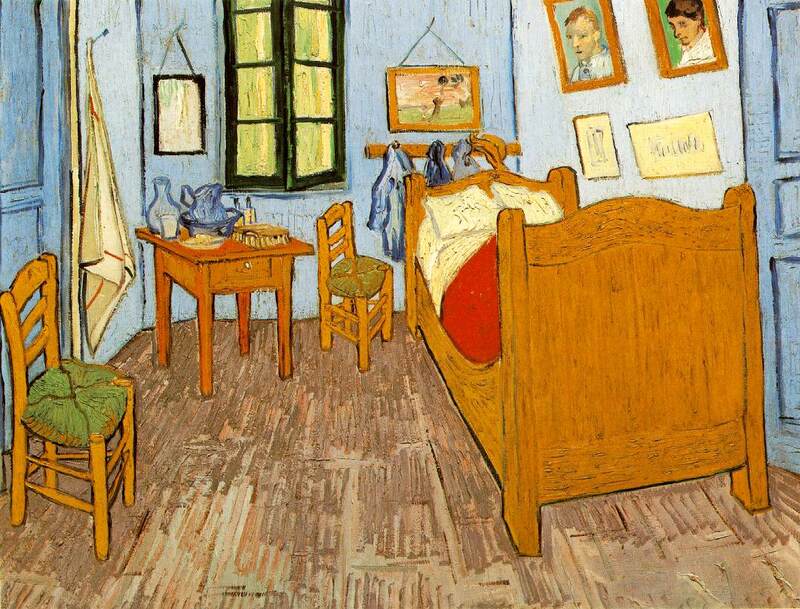 Van Gogh became obsessed by the symbolic and expressive values of colors and began to use them for this purpose rather than, as did the Impressionists, for the reproduction of visual appearances, atmosphere, and light. `Instead of trying to reproduce exactly what I have before my eyes,' he wrote, `I use color more arbitrarily so as to express myself more forcibly'. 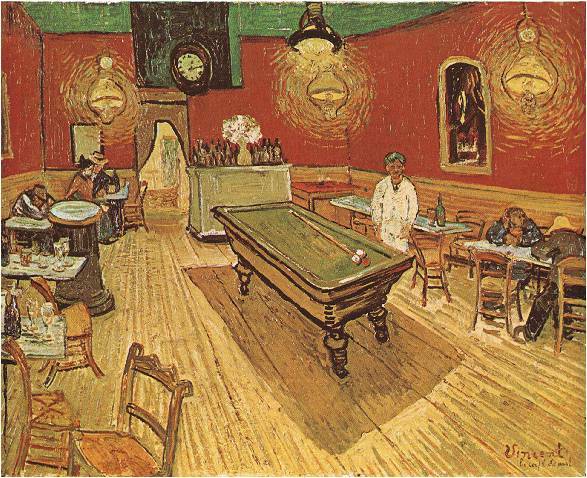 Of his Night Café , he said: `I have tried to express with red and green the terrible passions of human nature.' For a time he was influenced by Seurat's delicate pointillist manner, but he abandoned this for broad, vigorous, and swirling brush-strokes. 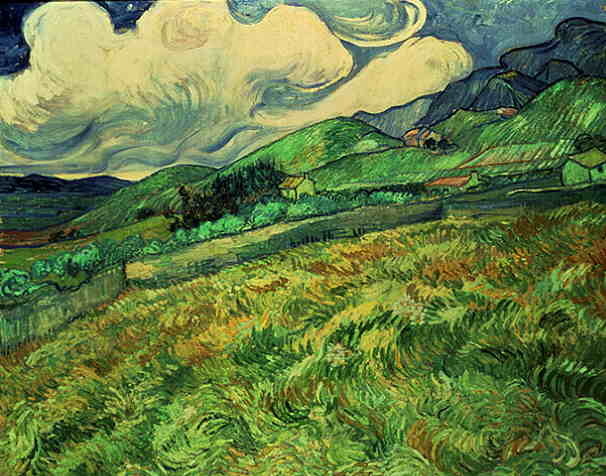 1888 (240 Kb); Oil on canvas, 72.5 x 91 cm (28 1/2 x 35 3/4 in); The Phillips Collection, Washington, D.C. He sold only one painting during his lifetime ( Red Vineyard at Arles ; Pushkin Museum, Moscow), and was little known to the art world at the time of his death, but his fame grew rapidly thereafter. His influence on Expressionism, Fauvism and early abstraction was enormous, and it can be seen in many other aspects of 20th-century art. His stormy and dramatic life and his unswerving devotion to his ideals have made him one of the great cultural heroes of modern times, providing the most auspicious material for the 20th-century vogue in romanticized psychological biography.